There are two short coolant lines that run from the water pump and radiator to the turbos. The two lines are subjected to very intense heat and deteriorate very quickly and can become a weak link in your coolant system. To get to them you have to remove the air box, intake hoses between the air box and turbos, and the air pump. See the Air Pump Removal How To. I looked into replacing these two lines with an after market hose but the hoses are so short and bend so much I decided to go with the stock units. They cost me a total of $15 from Mazdatrix. 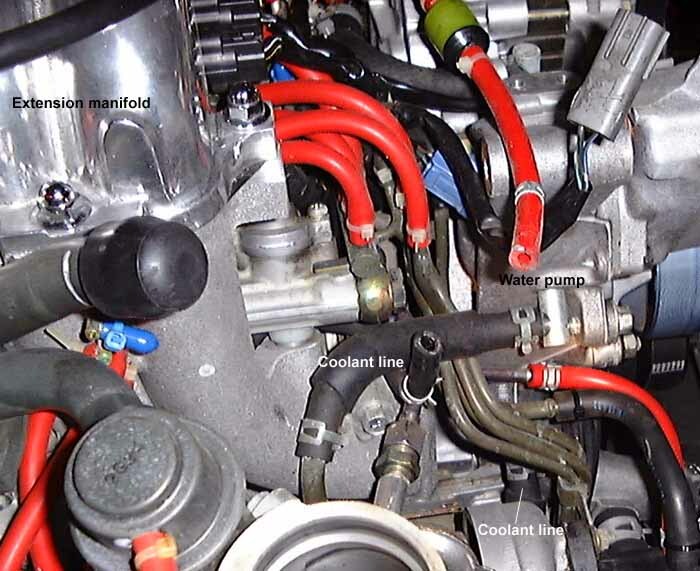 You will loose coolant when you pull these lines so you might want to go ahead and empty the cooling system anyway, see the Flush Radiator How To. Pull the hose clamps back and start working the lines loose. I used a screwdriver to pry back the ends until they finally came off. I used a five inch strip of emery cloth to clean up the metal coolant pipes so I would get a good seal with the new hoses. Slide the hose clamps onto the middle of the new pipes, slip the new lines on and move the clamps into position. Remember to top off and burp the coolant system when you're finished.